Custom imprinted and embroidered logo apparel. Fleece sweatshirts, hoods, tees, shorts, caps, blankets, ladies fashion, jackets and accessories. Backpacks, rolling bags, totes and more! 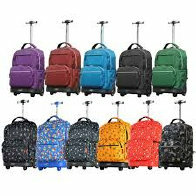 The mission of Luggage America, Inc. is to produce high quality, durable and reliable travelware in all of our products. With designs always on the cutting edge, our functional and creative features are presented in contemporary styles.